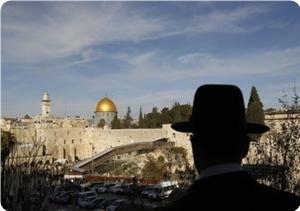 The Islamic Christian authority for patronizing Jerusalem and holy sites said that 2013 has seen an unprecedented escalation in Israel's Judaization activities in the occupied city of Jerusalem. In a report on Monday, the Islamic Christian authority said that during the outgoing year, the Israeli occupation authority (IOA) had seized more Palestinian lands, demolished scores of Jerusalemite homes, displaced hundreds of Palestinian natives and intensified its raids and desecration campaigns against the Islamic and Christian holy sites, especially the Aqsa Mosque. The IOA has also taken multiple measures and actions to Judaize occupied Jerusalem and its holy sites and erase their Arab identity. Secretary-general of the authority Hanna Isa said that the daily desecration of the Aqsa Mosque by Jewish settlers, troops and officials was the most prominent challenge which the Palestinian natives in the holy city had faced during 2013. 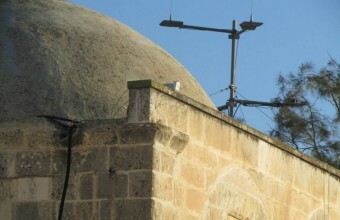 Isa affirmed that the IOA had established many Jewish shrines and projects for its settles around and beneath the Aqsa Mosque, including a museum under its foundations, warning that Israel has come close to declaring the Mosque a Jewish synagogue. 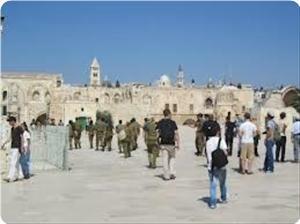 A number of Israeli settlers on Tuesday morning stormed al-Aqsa Mosque from the Mughrabi Gate, and toured its courtyards, under the protection of the occupation forces. Large numbers of Jerusalemite worshipers and students have intensified their presence inside al-Aqsa in order to confront any attempt to storm it, despite the ongoing security measures imposed against them on the mosque's gates. Al-Aqsa Mosque has been exposed to almost daily incursions by settlers in an attempt to divide it and impose the Israeli control over it. Ghassan Daghlas, PA official in charge of Israeli Settlements File in the northern part of the occupied West Bank, said that Price Tag gangs set fire to the citizens' cars and sprayed racist slogans on the walls of houses nearby. He pointed out that statistics of 2013 showed that there are a significant increase in the pace of attacks by the occupation forces and settlers compared to last year, especially with regard to settlement expansion and attacks on citizens' properties and lands. Separately, the Israeli occupation forces (IOF) arrested at dawn a Palestinian young man after raiding his home in the town of Beit Fajjar, south of Bethlehem. 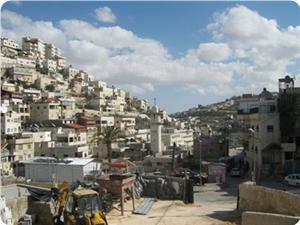 Locals reported that the IOF withdrew after vandalizing and damaging the residents' houses. An Israeli municipal crew raided under military protection on Sunday the Palestinian district of Silwan in occupied Jerusalem and notified its residents of some demolition orders issued against structures, including a Mosque, at the pretext of unlicensed construction. 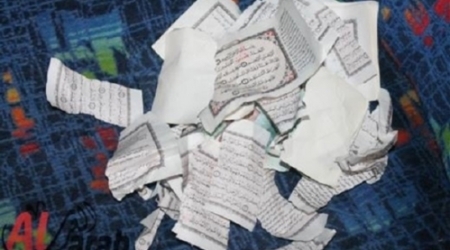 According to the information center of Wadi Hilwa, the municipal crew put up and handed demolition warnings against a mosque, homes and parking lots in Bir Ayyub and Ein Loza neighborhoods. The center said that the Palestinian owners of these structures were given 30 days to officially object to the demolition decisions. Eyewitnesses reported that the municipal crew photographed the structures to be razed in addition to entrances of some neighborhoods in Silwan. 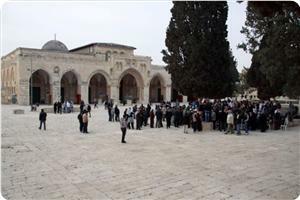 Groups of Jewish settlers stormed al-Aqsa Mosque on Sunday from the Mughrabi Gate under the protection of the Israeli occupation police. Local sources said that the extremist Rabbi Yehuda Glick led one of these groups during a tour in the courtyards of the mosque and briefed them on a Talmudic story about the alleged temple. The settlers have been storming al-Aqsa Mosque in small and successive groups, while the Israeli police have tightened procedures imposed on Jerusalemite worshipers at the mosque’s main gates. Meanwhile, the Jordanian Minister of Tourism Nidal Qatamin visited on Saturday Jerusalem, and called on Muslims and Christians to visit the city, which has angered the citizens and activists who described his visit as a normalization step. Many comments were published on social networking websites rejecting the Jordanian minister's step and calling for not responding to his call, because whoever visits Jerusalem under the occupation is recognizing the existence of occupation in the city. Earlier, PA President Mahmoud Abbas called upon Christians from all over the world to come to Palestine and the holy land, on the occasion of the visit to be held by Pope of the Vatican to the Holy Land next March 14. 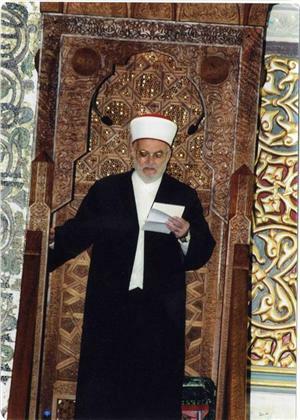 Sheikh Ikrima Sabri, preacher of the Aqsa Mosque, condemned the latest US overtures to the Palestinian Authority (PA), stressing that the Israeli occupation is persistent in annexing lands and expanding settlements. In his Friday Khutba (sermon) at the Aqsa Mosque, Sheikh Sabri said that one of the US proposals demands the Palestinian Authority to pay no attention to the issue of settlement construction, which means that Israel's settlements will remain like "cancer in someone's body." He also denounced the US proposal calling for solving the issue of the Palestinian refugees between the PA and the Arab countries, affirming that such American solution is aimed at liquidating the right of the Palestinians to return to the homes they were expelled from. Sheikh Sabri stressed that the Palestinian people would never recognize such US solutions and proposals and described them as illegitimate. The Aqsa Mosque preacher also talked about the violations committed by the Israeli police and Jewish settlers in occupied Jerusalem, especially at the Aqsa Mosque. He noted that the Israeli police set up lately surveillance cameras inside the Mosque's compound in order to watch the Palestinian worshipers who confront the repeated Jewish attempts to defile their Mosque. Israeli Knesset Interior Committee, headed by Likud party member Mary Rigab, has called on Israeli Premier Benjamin Netanyahu and the special Ministerial Committee to order a halt to the maintenance works carried out by the Islamic Endowment at al-Aqsa Mosque. 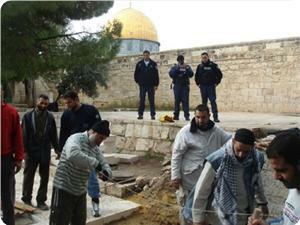 In its statement issued on Wednesday, the Aqsa Foundation for Endowment and Heritage said that the Knesset’s Interior Committee had convened on Tuesday a special session on maintenance works implemented by the Islamic Endowment Department in occupied Jerusalem. 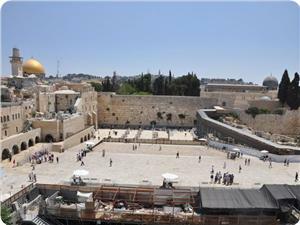 The Committee's members claimed during the session that Endowment Department's maintenance works may lead to the destruction of Jewish relics associated with the alleged Temple. 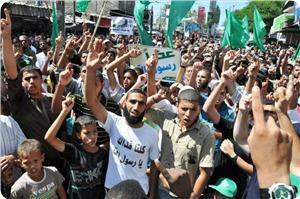 Al-Aqsa Foundation renewed assertion that al-Aqsa mosque belongs only to Muslims. Al-Aqsa was the first Qibla (direction to which Muslims face during prayers) for Muslims all over the world, towards which the messenger Muhammad, peace be upon him, carried out his night journey. The Foundation warned the occupation of intervening in the Islamic Endowment Department's affairs in Jerusalem, warning, in this regard, of the Israeli escalated threats against Al-Aqsa Mosque. This documentary investigates the serious environmental pollution in Southern Spain caused by the aviation accident of 1996 where atomic bombs hit the grounds of the area. A Palestinian official report showed that the Israeli occupation authority has continued its settlement projects, while the Prime Minister Benjamin Netanyahu vowed to continue settlement policy. The weekly report issued by the National Office for the defense of the land and the resistance of settlement activity, under the Palestine Liberation Organization, pointed out that despite the difficult conditions experienced by the Palestinian territories because of the bad weather, the Israeli government continued to commit further violations in disregard to all international conventions. The report pointed out that despite the fact that Europe and U.S. had warned the Israeli government not to launch new settlement projects, Netanyahu announced his government's commitment to continue settlement construction. Netanyahu said: "We are building without stopping, and we will continue construction and development everywhere, including in the settlements," while Deputy Minister of Israeli army Danny Danon stated that "Israel will never end its military presence in that region." The Israeli Public Relations Office has recently began marketing two settlement projects in occupied Jerusalem; one in Ras al-Amud and the other near Jabal al-Masharef. The construction is taking place in the center of Jerusalem not far from Silwan, and near the new Jewish settlement of Ma'aleh Zeitim. Palestinian media forum (PMF) has strongly condemned the plan of American TV company (NBC) to film a drama series, in partnership with the occupation municipality, in Silwan in occupied Jerusalem. PMF said in a statement on Thursday that the NBC Company is preparing to produce and broadcast a drama series in the "City of David", with the aim of strengthening the Israeli narrative about the city of Jerusalem, which would give legitimacy to Israel’s policies of apartheid, ethnic cleansing and colonization in occupied Jerusalem. According to Israeli and American media, the NBC network is cooperating with Israeli authorities, film makers and the Keshet Media Group to produce an action series entitled DIG mainly in occupied East Jerusalem, near the Old City. Most of the filming will take place in the so-called “City of David national park”, which is established on Palestinian property in the neighborhood of Silwan and which is operated by the Israeli settler organization El’ad and the Israeli Nature and Parks Authority. The PMF asserted that the production of this drama series comes within the framework of the falsification of history and the Judaization of Jerusalem. Khalil Tafakji, head of the Mapping and Geographic Information Systems Department of the Arab Studies Society in Jerusalem, said that the Israeli occupation authority (IOA) was planning to tighten its control of occupied Jerusalem. The expert told the PIC on Wednesday that the sacred sites in Jerusalem stretch at a large area from Jabal al Masharef and the Hadassah Hospital to Augusta Victoria Hospital, and include areas of Isawiya, Sheikh Jarrah and Jabel Mukaber. Tafakji added that the second area includes Sheikh Jarrah, the Israeli hotels area, the rear area of the U.S. Consulate and the area of Masrara. The third area, he pointed out, is located in the Jabel Mukaber. 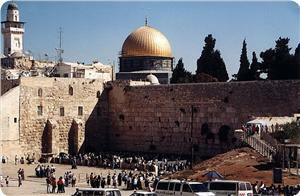 It is a large place that overlooks the Old City and with an important strategic value. The Israeli Jerusalem Committee, while discussing the repercussions of the last storm, proposed a new scheme that includes the seizure of a large area of Palestinian lands in the eastern part of the city of Jerusalem, which had been previously classified as sacred zones. Concerning the IOA decision to build a military academy in Jabal al Masharef (Mount Scopus), the settlement affairs expert said: "Lawyer Hosni Abu Hussein has been informed over two months ago that the Israeli government has postponed the project to establish a military academy in the region." He pointed out that the Jerusalemite Civic Coalition has rejected the IOA project to establish military colleges in the area, which was surprisingly accepted by the Israeli government’s legal advisor. Tafakji noted that the new IOA plan includes restoring historic buildings, establishing walls around the historical places, and renewing the historic statues, and aims at tightening the Israeli control over the Old City of Jerusalem and its surroundings. This Tuesday the custodian of Muslim holy sites in Al Quds(Jerusalem), demanded on that Israel remove their surveillance cameras at the city's sensitive Al-Aqsa mosque compound. "Jordan rejects Israel's installation of surveillance cameras on December 8 to monitor waqf officials and worshippers, particularly women," Information Minister Mohammad Momani, reported news agency Petra and went on to say that “Jordan does not accept that Israel has set up a police station inside the compound. It is a flagrant military violation of the freedom of worshippers as well as an interference in the affairs of the Jordanian Islamic waqf. Israel should not ignore Jordan's diplomatic efforts to stop violation of the Al-Aqsa mosque compound,"
"Jordan will not stop its efforts to prevent Israel from imposing a new status quo in Jerusalem." Sitting on top the Western Wall plaza, it houses the Dome of the Rock and Al-Aqsa mosques and is Islam's third-holiest site. 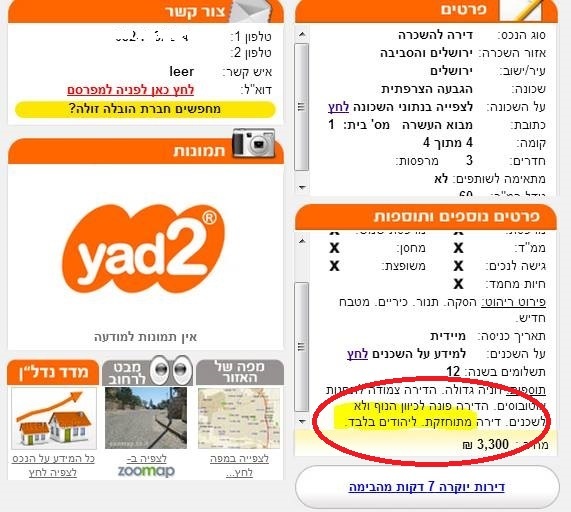 Last week, an ad for a vacant apartment in occupied Jerusalem was published on a famous Israeli social website; after detailing the specifications of the property, the price and whatever else, it went on to say, “rent is only for Jews”. The advertisement states that the apartment in located in the French Hill in Jerusalem, “great view… close to transportation and Only for Jews”. The Arabs48 news website phoned the advertiser of the property, and asked him about the issue, and he told them that he “follows the Torah”, and only rents to Jews. A Reporter of the Arabs48 tried to get more information, but when the Jewish-Israeli man realized he is speaking to an Arab, he disconnected the call. Many Arabs in historic Palestine complained about the issue, and stated that such racist issues are increasing in Israel, not only when it comes renting apartments. Back in 2010, 18 prominent Israeli Rabbis, including the chief rabbi in Safad, issued a document calling on Jews not to rent or sell apartments to non-Jews. One of the rabbis who signed the document is Shmuel Eliyahu known for his inflammable, racist statements against the Arabs. They said that there “has been an increase” in the number of Arab students in Safad, an issue that increased demand for rent, and that this decree comes to limit the number of Arabs in the city.